Three inauspicious cardboard boxes stuffed in a suitcase, and hidden in a Mexico City closet for over 70 years was revealed as a treasure trove of photography in 2010. 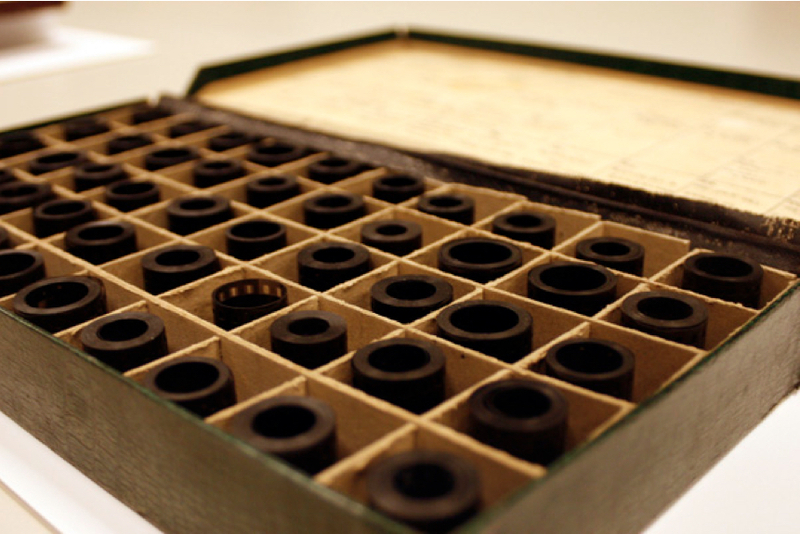 ‘The Mexican Suitcase’, as it was called, refers to three boxes containing organized 35mm film rolls that were smuggled out of France at the beginning of WW2, likely by the Mexican ambassador. Within the boxes was 126 rolls of film (about 4000 photos) from three of the most important photojournalists to cover the Spanish Civil War; Robert Capa, Gerda Taro, and David ‘Chim’ Seymour. 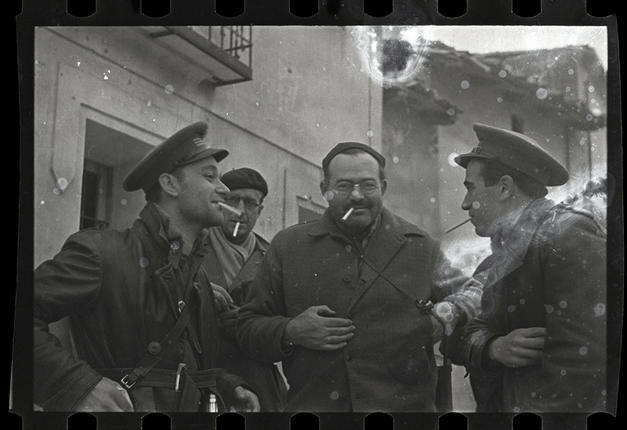 These three young and idealistic photographers entered Spain in 1935/6 to document the terrible struggle between the elected Leftist government, and the forces of General Francisco Franco, who was backed by a coalition of monarchists, capitalists, the Catholic church, and Fascists. Hoping to sway international opinion through their photography, Capa, Taro (Capa’s lover), and Chim took dramatic photos which changed the course of photography, if not the war. With the mantra ‘if the photo isn’t interesting, you’re not close enough to the battle’, these three were intimately involved with the Republican soldiers fighting against the Fascist-backed rebellion. The three photographers weren’t the only foreigners helping the Republicans via media accounts; luminaries such as Ernest Hemingway, Paul Robeson, Pablo Neruda, and George Orwell (who actually took up arms, and wrote ‘Homage to Catalonia’ about his experiences in the war) felt the urgency of fighting the European tide of Fascism which arose in the 1930s in Italy and Germany. 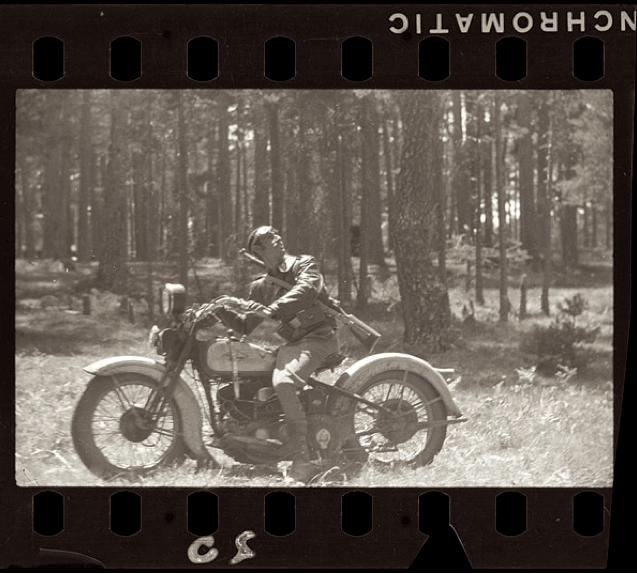 The Republican soldier riding the motorcycle was photographed by Gerda Taro (the nom de plume of Gerta Pohrylle of Germany), who was hiding in the forest during an aerial attack by German Heinkel He51s during the battle of Navacerrada Pass, between Madrid and Segovia, early June 1937. This very battle is the setting for Ernest Hemingway’s ‘For Whom the Bell Tolls’, in which a journalist/Hemingway stand-in, Robert Jordan, is an American who travels to Spain to fight fascism. 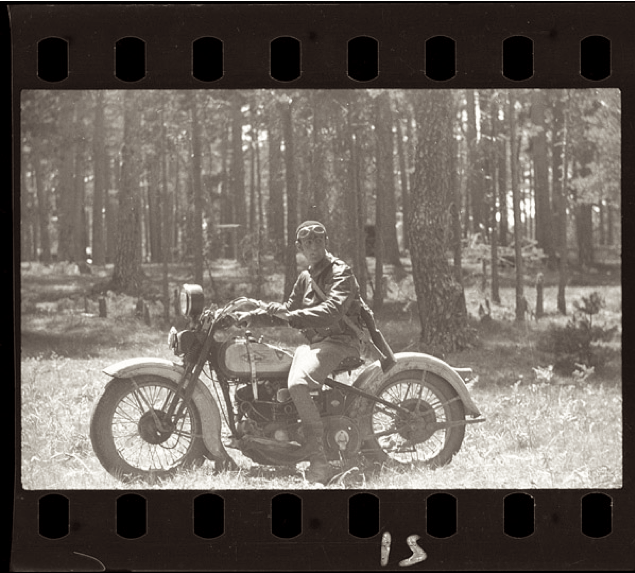 About 2800 Americans (the ‘Abraham Lincoln Brigade’) did so, although I doubt any brought their motorcycles, as there was an official US embargo on providing any material aid to the Spanish, and some of the Americans were prosecuted after returning to the US. The Harley Davidson looks to be a ‘VLD’ model of 1932-’36, their 74cubic inch sidevalve roadster, hardly suited to the kind of off-road work used in a military campaign… but of course, private motorcycles were pressed into service during war in Spain, and shortly after, the rest of Europe. The Harley has a German Bosch headlamp, which may have been a convenient replacement for the original item, after damage. No other modifications appear to have been made to the bike; Spain had no time to make specialist war equipment or even paint military machines drab or camouflage. In his leather jacket and boots, plus beret and goggles, the rider could be any of us on his Harley, out for a spin in the woods. 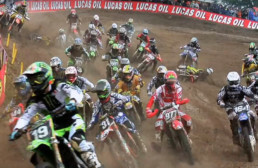 But the look of anxiety on his face, keeping his hands on the ‘bars, means our rider is ready to hightail it at the first sign of an incoming plane. 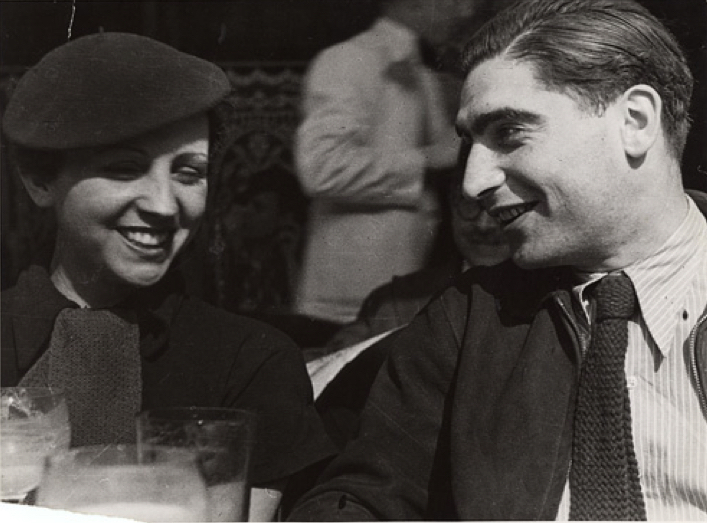 Gerda Taro was initially linked professionally to Robert Capa, with her photos being released under a Taro&Capa byline, but she struck out on her own after refusing Capa’s marriage proposal in Spain. Her photos of the bombing of Valencia, and her reportage from Brunete, were her most celebrated work, but she was killed in an automobile/tank accident during the Battle of Brunete, shortly after the photos in the Mexican Suitcase were taken – she was 27 years old. She was the first female photojournalist to cover a war, and the first to die in the process. Robert Capa survived his time in Spain, and went on to photograph WW2, embedded with American troops, and was awarded the Presidential Medal of Freedom by Dwight Eisenhower. He founded the Magnum Photo agency in Paris in 1947, with Henri Cartier-Bresson, William Vandivert, David Seymour, and George Rodger, and became a celebrated and successful photographer for magazines around the world. Although he swore off war photography after WW2, he was lured by the French war in Indochina (Vietnam), and secured a job reporting there for Time-Life magazines. He was killed after stepping on a land mine in 1954; he was 40 years old. David ‘Chim’ Seymour (born Dawyd Szymin in Poland) was sent to Spain on assignment by Regards magazine in 1935, and remained covering the war for 4 years, before escaping with Republican refugees to Mexico aboard the SS Sinaia in 1939. He entered the USA that year, and joined the US Army after Germany invaded Poland, his birthplace, in 1939. He was a photographer for the US military, and was naturalized as a US Citizen in 1942, the same year his parents were killed in a Nazi concentration camp in Poland. 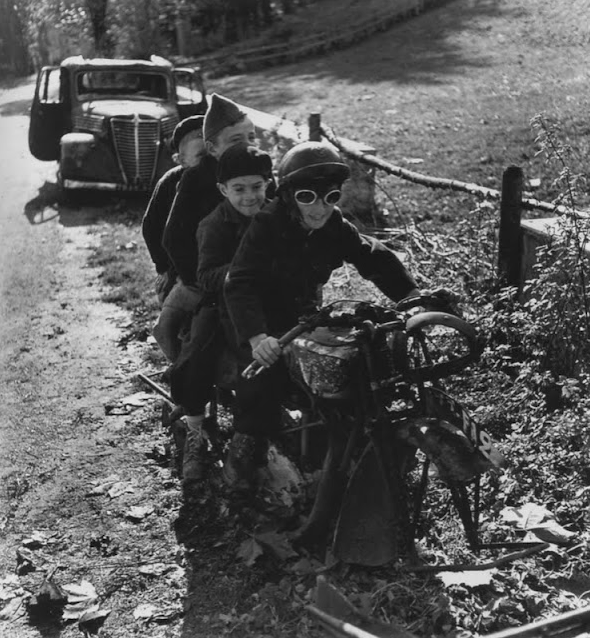 After the war, he photographed the plight of poor children around the world for Unicef, and founded Magnum Photos with Robert Capa in 1947, becoming president of the group when Capa was killed in 1954. He was killed by machine-gun fire in Egypt while covering the Suez Crisis in 1956 – he was 44 years old. The story of the Mexican Suitcase with all its characters and weight of history is one of the best stories of the 20th Century. I love that you published this. 50 years ago as I was first discovering motorcycles I became a fan of Robert Capa buying my first coffee table book ‘Images of war’ thereafter got hooked on all the magnum greats. What a find and good to see some of these long forgotten images. 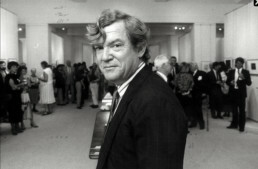 In the early 80′ Hughes came to Chicago for a lecture and I was invited to the reception in his honor that evening. As the evening wore on and all of the other guest left, Hughes, the host and myself, drank a copious amount of cognac and became quite rowdy. If fact, Hughes and I were asked to leave the reception due to the raucous conversation. When the doorman escorted us out, Hughes spied my R100RS BMW which was parked in front of the Astor Street location. He asked for a ride to hotel, which I hesitated to do, but he was insistent. Down Lakeshore Drive exceeding greatly the speed limit and Hughes screaming in my ear to go faster, faster, faster. Thankfully we made it to the hotel and I was relieved of the responsibility of chauffeuring the world’s greatest art critic safely home. The speedo read over 110 mph and he delighted in the risk. What a terrific story! Hughes was quite a fellow, and so are you! Excellent article! This is why we read the Vintagent. My grandmother, Gusti Stridsberg, worked as a nurse and journalist during the Spanish Civil War. In her autobiography ‘Menschen, Mächte und ich’ (translated into English as ‘My Five Lives’) she gives a vivid description of what life was like for doctors, nurses and soldiers. Her account of life in Moscow during the first 5-year plan is equally interesting….. 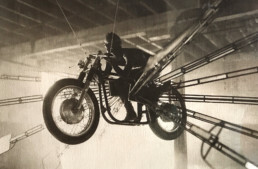 I have loved motorcycles and history all of my life. But the Spanish Civil War occupies a unique place in history. It was Hitler’s practice for WW II. The Americans who surreptitiously traveled to Spain to join the fight deserve special recognition. Is there a place on line where I can see more of the photographs? Thanks for the article.